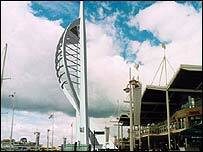 A parachutist broke through security at Portsmouth's landmark Spinnaker Tower to "base jump" 350ft (107m) from a platform, it has been revealed. The jumper is thought to have forced a door and made his way to a viewing platform in the early hours of Tuesday. Security is now to be reviewed at the landmark, which has been beset by problems since it was first proposed to mark the millennium. The incident has been reported to Portsmouth police. David Greenhalgh, project manager for the tower, said, "Following a review of CCTV footage, I can confirm that a base jumper gained access to the Spinnaker Tower site in the early hours of Tuesday morning. "It appears he accessed the site by climbing over a balcony in Gunwharf Quays and sliding down a column onto the ground. "This action appeared to be timed to coincide with the movements of the security guard. "He then ran onto the podium and forced the door at the base of the staircase and was then seen on the staircase heading towards the top viewing platform. "CCTV footage does not show him jumping but we believe he landed in the service yard where he picked up his chute and ran to a waiting car. "The registration number of this car was picked up on CCTV." A spokeswoman for Hampshire Constabulary said the jump had been reported to them but added: "It is not a crime to jump off a tower."